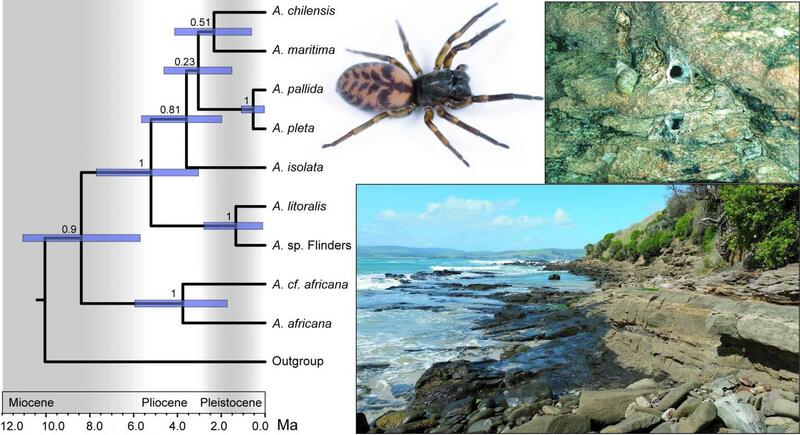 Coastal spiders may have undergone transoceanic dispersal eastward from South America to South Africa, Australia and New Zealand as the Amaurobioides genus evolved, according to a study published Oct. 12, 2016 in the open-access journal PLOS ONE by F. Sara Ceccarelli from Museo Argentino de Ciencias Naturales, and colleagues. Amaurobioides is a genus of coastal spiders found on three Southern Hemisphere continents: Australasia, Africa and South America. It was previously unclear whether an ancestral population existed on the ancient supercontinent Gondwana and was geographically separated when Gondwana broke up into modern day continents, or whether Amaurobioides arose on a single continent and later underwent long-distance, transoceanic dispersal to reach others.To address this question, Ceccarelli and colleagues considered mitochondrial and nuclear gene fragments, using DNA from 45 Amaurobioides specimens and 60 specimens from related taxa, as well as sequences from previous studies, to construct an Amaurobioides evolutionary tree. The researchers suggest that an ancestor of Amaurobioides may have dispersed eastward during the Miocene era from South America to South Africa, likely aided by the establishment of the Antarctic Circumpolar Current. The Amaurobioides genus originated in South Africa and dispersed further eastward to Australia and New Zealand in the early and mid-Pliocene. Finally, Amaurobioides species recolonized South America at the end of the Pliocene, completing the eastward circle of long-distance dispersal around the Southern Hemisphere. The coastal habitats of Amaurobioides species may have been conducive to this unusually large scale transoceanic dispersal, which the authors propose occurred by "rafting" across oceans on mats of vegetation. While there are other possible explanations for the present day distribution of Amaurobioides species, this study may shed light on how Southern Hemisphere species have come to be distributed across continents.